According to the language of the resolution, all relationships between instructional officers, including undergraduate TAs, and any undergraduate will not be permitted. Following a contentious debate, the University Senate passed a resolution that forbids all romantic and sexual relationships between undergraduates and faculty, staff, and TAs at the Senate plenary meeting on Friday. In 2012, the Senate passed a resolution banning non-consensual or coercive romantic and sexual relationships between faculty and students. The new resolution, which was presented by University Senators Jeanine D’Armiento, an associate professor of medicine, Greg Freyer, a professor from the Mailman School of Public Health, and Izzet Kebudi, SEAS ’19, began as an undergraduate-led effort and was formalized by the Student Affairs Committee and the Faculty Affairs Committee. As the resolution passed with a 28-9-7 vote, Columbia became one of the last of its peer institutions to enact such a policy. According to the language of the resolution, all relationships between instructional officers, including undergraduate TAs, and any undergraduate will not be permitted. The last paragraph of the resolution grants the Provost’s office the ability to grant exceptions in “unusual circumstances,” although the resolution does not detail what specific circumstances would justify an exception. Many senators were unclear on how the Provost’s office would handle exceptions to the ban on relationships. Michael Rosen, a professor of pharmacology and pediatrics, noted that the Faculty of Affairs Committee barely passed the resolution because it did not adequately represent or defend appropriately against a problem that exists at the University. He explained that he mainly disagreed with the final part of the resolution that required the disclosure of consensual relationships to the Provost or the Vice President of Human Resources. Joseph Ulichny, associate in chemistry, who teaches General Chemistry Labs, questioned whether he would have to ask prospective undergraduate TAs whether they were currently in a relationship before hiring them. Kebudi pointed to the “inherent power dynamic” that exists between faculty or staff and students as the reason for the undergraduate support for the resolution. The resolution received unanimous support from undergraduate senators, but many faculty stated that the resolution didn’t allow undergraduates autonomy in their social lives. Eli Noam, a professor in economics and finance from the Columbia Business School, argued that as legal adults, students should be able to make their own decisions regarding romantic relationships. Under the resolution, certain cases of romantic and sexual relationships can be authorized by the Provost, when faculty is involved, or by the Vice President of Human Resources, when staff is involved. 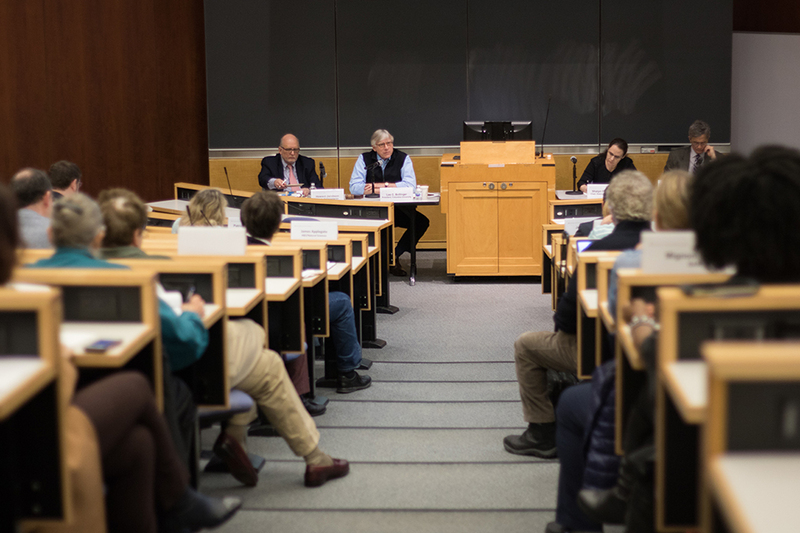 At multiple points during the debate, faculty asked for statistics about the current number of consensual relationships between faculty or staff and students. The University does not collect this kind of data. Many faculty members, such as astronomy professor James Applegate, cited this lack of clear evidence as a reason not to pass the resolution. The faculty that supported the resolution argued that the University receives no benefits from not having such a policy in place. Noam motioned to vote to table the resolution, citing that he would like to see changes made to reflect the debate that occurred. The motion was seconded, but the vote failed. According to the proposed agenda, President Bollinger was supposed to attend the plenary and answer questions but did not attend, thereby avoiding questions about the graduate student union strike.